Scott Leach, has been with Clark & Associates Land Brokers, LLC since 2006. Ranch-raised and an avid outdoorsman, Scott has been a cowboy on working ranches, wrangled on guest ranches, and guided on a few exclusive Wyoming hunting and fishing lodges for big game, predator, and fly fishing. He was also an Orvis-endorsed guide from 2000-2005 at the North Platte Lodge near Casper, Wyoming. From 2000 to 2011, he was general manager of working and recreation ranch in Glendo, Wyoming. Scott believes maximizing natural resources and good stewardship practices are a key factor to the appreciation of land and protecting one’s investment. Scott is dedicated full-time to bringing buyers and sellers together and finding the right property for the individual buyer searching for the farm and ranch property that fits their individual needs. He brings an extensive knowledge of both commercial and private outdoor recreation, farm, and ranch properties to Clark & Associates Land Brokers, LLC. 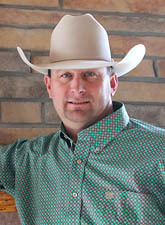 Scott lives near Glendo, Wyoming with his wife Sheila, son Chance, and daughter Kiersten, and is licensed in Wyoming, South Dakota, and Nebraska.